I can now announce that I have well and truly got used to drinking Rakia. I know this because I just can't eat salad now without a glass of Rakia. It just doesn't seem right. 7 months ago when I first went to a Bulgarian's house for dinner I couldn't believe that we were drinking strong alcohol with salad, it just seemed so strange. I can remember speaking to one of my friends from the UK on the telephone and telling him that Bulgarians have salad with this strong, brandy type alcohol called Rakia. He couldn't believe it either and asked me "What?? Brandy with salad??? Do they pour it over the salad or drink it?" That's how strange it is to people who are 'un-rakia-ised'. I get the same reaction from many Bulgarians when I tell them that I could never eat chips (пържени картофи) without vinegar - it just seems such a strange combination to them. Ivo, the security guard who has now probably become my best friend in Bulgaria, insisted last week that I go up with him to a room on the 10th floor of our accommodation block to meet the mother of a girl called Elena. Apparently she works in tourism and might be able to get me a job on the black sea coast for the summer. I hadn't even thought about getting a job on the coast to be honest, I had never even been to the Bulgarian coast, I'd been pretty much rooted in Sofia for 7 months. I went up anyway, had a little chat with her and she said she'd be in touch with Ivo about an interview. True to her word Ivo stopped me the other day and said that Elena's mother has arranged for me to have a job interview in Sunny Beach in 2 days time and that I have to go and buy a bus ticket. Great! I got my suit dry-cleaned, bought my bus ticket and settled down for a near 7 hour journey to Sunny Beach. I was also confident enough with my Bulgarian by this point that I didn't have any worries about having an interview in Bulgarian. I hadn't really spoken any English in 7 months, apart from occasional calls home and had consciously tried to avoid Bulgarians who tried to speak to me in English. If anyone did speak to me in English I would always reply in Bulgarian. I suppose you have to be a bit stubborn like that because there are so many Bulgarians who speak really good English, and who are keen to practice it, that it would be fairly easy to find yourself speaking English all day long. So 7 hour bus journey over I arrived in Sunny Beach bus station. My interview wasn't until the next day so I went for a wander around the resort. It was obvious the season hadn't really started yet because everything was eerily quiet. Not much was open and the beach, which stretched for miles, was almost deserted. I bought myself a can of beer, took my shoes and socks off and went for a stroll on the beach. I was enjoying this and really hoped I'd be able to spend the summer here. The interview was held in the back of a back street hotel in Sunny Beach, I still didn't know what the interview was for and what job I was even applying for. For me it was just important that I'd get some sort of job on the coast. I felt a bit of a plonka when I turned up for the interview because out of a room of about 50 people - young, student looking types - I was the only one dressed remotely smartly. Not only that, I was in a full-blown suit together with waist-coast and tie. Everyone else was in shorts, tracksuit bottoms, T-shirts, hoodies. I was really overdressed, stuck out like a sore thumb and was feeling like a right foreigner. 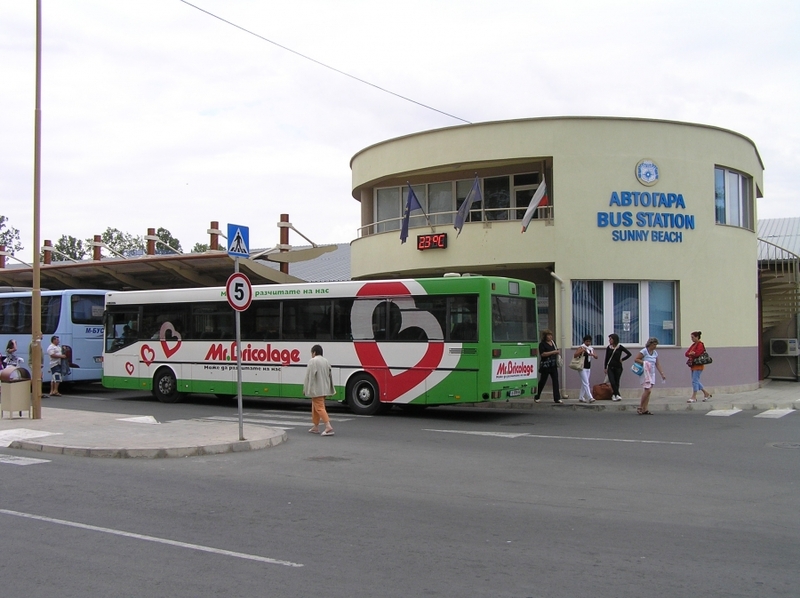 The job interview turned out to be for a courier on the buses picking up tourists from the airport in Burgas, taking them to the hotels and vice-versa. Accommodation would be provided free of charge and we would get 3 leva an hour plus any tips. I had learnt a bit of spiel about Bulgarian history, a few important Bulgarian historical figures and interesting places around Bulgaria but didn't get asked any of that. They were more interested in what the hell was I doing in Bulgaria and then more or less gave me the job on the spot by telling me on my way out that I'd need to be in Sunny Beach by the 20th April - that was in about 10 days time! I was thrilled, I know the pay wasn't great but for me it was a fantastic opportunity to practice my Bulgarian and spend a summer living on the coast. Yipeeee! Now I just had to sort my stuff out in Sofia ready for the move. I officially had 2 months left of my Bulgarian course in Sofia and had also paid accommodation up front for the whole 9 months too. I didn't think there was any chance of getting some kind of refund but my teacher told me to write a 'молба'. You can't do many things in Bulgaria without a 'молба' but I have grown to quite like them because they give you a chance to explain your situation, say what you are after and then whoever reads it can decide to sort it out or not. In fairness I've never had a 'молба' that hasn't sorted the issue out. In the UK you either tick this box or that box but there is no room for when you inevitably don't fit into either box. In Bulgaria you can just write a 'молба' and in this case it also resulted in me at least getting some of my money back for unused lessons and accommodation. I was to need all the money I could get on a 3 leva an hour wage in Sunny Beach, I didn't have any savings or any money to fall back on so needed to be very careful with the finances from here on.